Following the Crown Estate Consultation on their proposal to build 150 – 200 houses on the Crown meadows, The Bryanston Park Preservation Group (BPPG) carried out its own consultation involving the delivery of 6,500 leaflets to homes in Blandford, Blandford St. Mary and Lower Bryanston. This was followed up with a formal petition so that the democratically elected NDDC councillors could be made aware of the strength of opposition to the proposal on the part of local residents. Of major concern is the effect that the additional traffic will have on the already badly congested one way system. The main route into and out of the site would be via the existing road off White Cliff Mill Street to Deer Park Stables. We collected signatures for the Petition at the Georgian Fayre in May 2012, in the Marketplace on Saturdays, by calling door to door and on an ePetition and out of area iPetition in July and August 2012. Thank you to all of you who supported us in signing the Petition - we gained 5,756 signatures. Nearly 6000 of you, more than 60 per cent of the population of our market town! 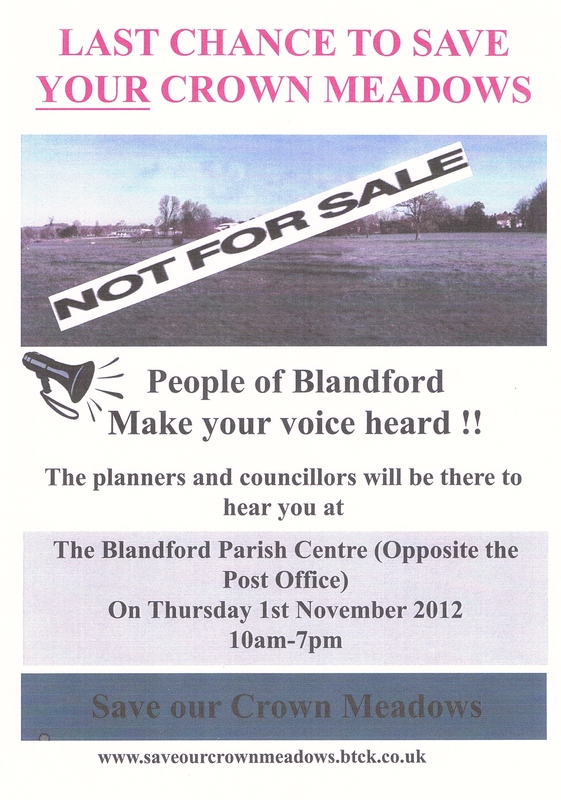 Since then volunteers were present in Blandford town centre on the 1st November 2012, the day of the Public Consultation exhibition in Blandford, to let people know that this was happening - since only a few days notice had been given by way of a small advert in the Blackmore Vale magazine. We handed out leaflets giving people information on the next steps North Dorset District Council were taking. We are working behind the scenes to keep up the pressure of this campaign to say NO TO ANY DEVELOPMENT ON THE CROWN MEADOWS.